Gabriel is a 9 month old, Black GSD. He is now about 100# and a wonderful boy. He has been working on his personal protection training with Ultimate Protection K-9 Training Club in Chilhowie Va. He completed his CGC with flying colors. When he is not training he is a total goofball.. making me laugh on a daily basis. Total German Shepherd: Talk about a handsome black GSD puppy - Gabriel certainly is that and whole lot more. Congratulations on all his training too - that is exceptional! If more people got their dogs through CGC training at a minimum what a wonderful world it would be! I really love black German Shepherds - such handsome animals. And just simply stunning to look at too. I have had one in the past and she was a handful to say the least. 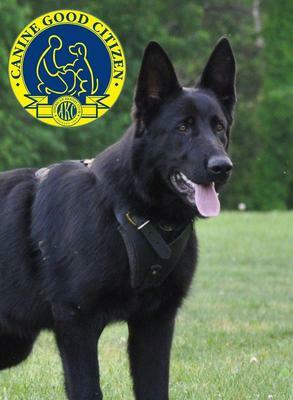 Keep us up on Gabriels future training because that is one thing that German Shepherds absolutely excel in! They need a reason to use that incredibly intelligent brain and training is a great way to do it. Good luck in the future with Gabriel and many years of companionship to you both! Your puppy Gabriel and so handsome but he doesn't look like a puppy; he is so big and strong; weighing over 100lbs! What an accomplishment is has achieved and more to come. Shepherds are naturally Protectors and Gabriel is even more with his professional training - good for him. Take care of Gab and he will take care of you!